Blackberries respond well to fertilizer applied in the spring and after they are producing blackberries, according to Utah State University. The best fertilizer to use is one that contributes nitrogen, phosphorous and potassium. These three macro nutrients help blackberries grow, produce fruit and resist diseases or pests. 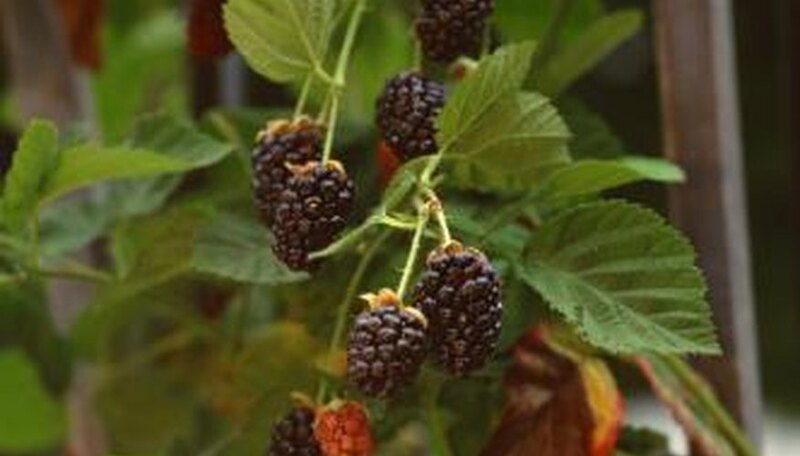 Using the wrong type of fertilizer or excessively fertilizing your blackberries results in unhealthy plants. Fertilize your blackberry plants in the spring with a fertilizer that has a balanced NPK ratio such as 8-8-8, according to the National Gardening Association. A balanced percentage of nutrients prevents blackberry plants from producing a flush of growth at the expense of their root system. Monitor your blackberry plants for signs of fruit development. Apply a small amount nitrogen fertilizer to your blackberry plants after you see signs of fruit, as suggested by Utah State University. You can use a nitrogen fertilizer at a rate of 20 lbs. per 1,000 square feet. Avoid applying excessive amounts of nitrogen to your blackberry plants because it causes stress to their root systems. Also, excessive fertilizing causes a flush of growth that is attractive to pests. Measure out the amount of fertilizer that you need. Apply the fertilizer 12 to 24 inches away from the base of the plant, as recommended by the National Gardening Association. Work the fertilizer into the soil with a hoe. Water the area thoroughly after applying the fertilizer, so that it sinks into the soil and is available to the root system. Avoid getting the fertilizer on the plant itself. The nitrogen in fertilizer causes burning when it comes in direct contact with blackberry plants. In addition to fertilizing, gardeners must check their soil's pH. Growing blackberries outside of their preferred pH range of 5.6 to 6.2 results in unhealthy plants. Blackberries cannot absorb nutrients when the soil pH is outside of their preferred range. Check the soil's pH in the early spring before planting. Spread lime on soil that is under 5.6. Apply elemental sulfur to alkaline soils or soils with a pH higher than 6.2.